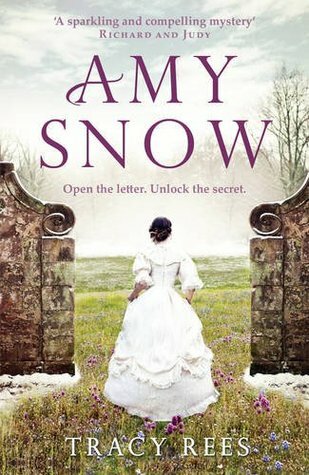 In 1831, Aurelia, eight-year-old daughter and only child of Lord and Lady Vennaway, once again disobeys her governess and rushes out to play in the newly fallen snow on her family’s English estate. Headstrong and spoiled, but also compassionate and inquisitive, Aurelia is shocked to discover an abandoned infant left in the snow. Although her parents disapprove of the child, they are unwilling to deny anything to their only child. And so, Amy is raised in the household. She spends most of her time below stairs and out of the Vennaway’s sight, but Aurelia is ever diligent and stops in very frequently to be with Amy and comfort and guide her. As Amy grows older, she provides a comforting balm to Aurelia’s flighty personality. Grudgingly, the elder Vennaway’s allow Amy into the schoolroom to take lessons with Aurelia when the tutor recognizes the effect Amy has on the young heiress. Although Amy has Aurelia’s love and devotion, life at Hatville Court is challenging. She helps the servants with the chores, but Amy learns quickly that it is best that avoid all contact with Lord and Lady Vennaway. She isn’t able to make a connection with the servants, because they think she is above them. The bond however between the girls is as close as sisters and eventually, Aurelia makes Amy her personal companion. Aurelia’s parents push for a marriage which would eventually give them the heir they so desire, but these plans are cancelled when Aurelia is discovered with a terminal illness. Amy serves Aurelia in her final days as a nurse, but immediately following her death, funeral, and reading of the will, the Vennaways make it clear that Amy is to leave Hatville Court. Prior to her departure, Amy is secretly visited by Mr. Clay who presents Amy with a letter from Aurelia that he was charged to deliver to her before she left Hatville. Even in death, Aurelia is taking care of Amy and sets her on an adventure that would change her life. The coded letter starts Amy on journey that enables Amy to discover not only who she is but also who she wants to be. Her quest takes her to various locations around England and she meets a cast a characters, including a warm and welcoming family, a cantankerous old woman, and two dashing gentleman who vie for her heart. The end result of the clues, puzzles, and hidden signs leads Amy to a conclusion that could threaten no only herself, but Aurelia’s legacy. What a delightful story!! I was intrigued by the puzzles and clues that were left to Amy, and the author does a wonderful job at allowing the reader to solve the mysteries along with her. The story is truly a coming-of-age story with a great deal of mystery and subterfuge. The author alternates the story between Amy’s present day situation and the story of her life with Aurelia though the memories. Although the memories often help Amy solve the clues, they also provide so much insight about Aurelia and the relationship between the girls. Amy is an admirable character and the reader enjoys watching her growth and discovery; however, even though Amy is the title character, I felt the story was really that of Aurelia. Her depth of compassion, rebellion, and understanding of the world around her is evident through the quest she devises and I really felt she grew into herself posthumously through Amy’s own self-discovery. The story is rich in detail about clothing and social mores and conventions; the reader feels Amy’s own spark of surprise and delight as her knowledge of the world grows. The story is also full of entertaining and memorable secondary characters who help Amy on her journey. Although a completely different type of story, I was reminded of Tasha Alexander’s Lady Darby series and Deanna Raybourn’s Lady Julia Grey series, in that the main characters truly learn the story of someone’s life after their death. In all three cases, the story of the deceased character is told through letters, mementoes, and remembrances of other characters. It is a really interesting way to tell a story. The novel includes a wonderful interview with the author and a collection of book club discussion questions. I really enjoyed the author’s writing style; she has one other book published called Florence Grace. It is currently sitting in my Amazon wishlist! This entry was posted in Individual Books and tagged Amy Snow, Bath, deanna raybourn, England, Lady Emily, Lady Julia Grey, puzzles, tasha alexander, Tracy Rees on August 8, 2016 by kvgaughan. Marianna Mayfield is beautiful, spoiled, and conniving. Her husband, Sir John Mayfield, is moving his wife out of Bath to an undisclosed location in a last-ditch effort to separate her from her lover and retain some dignity to his family name. As Sir John has dismissed all the servants and staff, Marianna has no way to get information to Anthony so that they can be reunited. Hannah Rogers left Marianna’s employ suddenly months ago; when she arrives to request her final allowance, Marianna sees an opportunity. Pleading a “friendly face” on this new adventure, Marianna convinces Sir John to allow Hannah to accompany her as her traveling companion. Although Hannah is reticent about leaving Bath, she accepts the job. As the carriage pushes through a storm to its new location, an unthinkable tragedy occurs. The carriage slips on the ice and crashes to the Channel below. Hannah is pulled underwater. When she regains consciousness, she learns the awful truth – both the coachman and Marianna Mayfield perished in the accident and Sir John is unconscious and uncertain to recover. Mr. and Mrs. Parrish, the caretakers at Clifton House in Devonshire, a home of Sir John’s, slowly nurse Hannah back to health and help her to gain back her strength and memory. Once Hannah’s health and lucidity return, she realizes the second awful truth – the Parrishs think that she is Lady Mayfield and it was her servant who was washed away. Struggling to find the opportunity to clarify the misunderstanding, Hannah can’t find the right way to rectify the situation. Even when Sir John regains consciousness and shows improvement, he makes no efforts to correct the mis-identification. But the charade threatens to unravel when Sir John’s solicitor arrives. James Lowden has taken over Sir John’s accounts following his father’s death and has arrived at Clifton House to find a very different Mrs. Mayfield than the one that had been described to him. Hannah also fears for her infant son’s safety. As she sought work in Bath, she had to leave him at Mrs. Beech’s, a home-care orphanage. Because she was incapacity following the accident, she is desperate to regain custody of her son and find a way to ensure his future well-being. At the same time, she must also figure out why Sir John does not call her out on her fraud. The cover of this Regency era novel suggested part Jane Eyre, part Downton Abbey, and part Wuthering Heights. 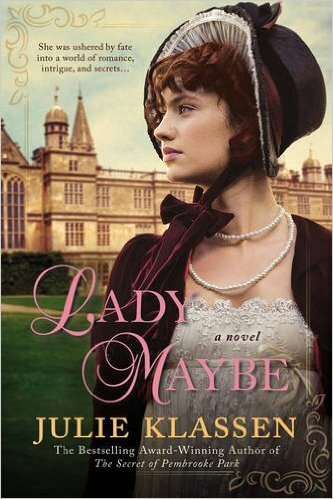 A gothic style mystery full of romance, adventure, and mistaken identities, Lady Maybe was a very enjoyable read. Although the mystery aspect was rather predictable, there were a few plot twists and surprises that made the novel quite interesting. I enjoy a departure from a straight mystery now and then, and this book was a refreshing change. I will say that the ending worked out a bit too neatly but it was a nice story and a relaxing period read. Fans of the Regency era and any period drama will appreciate the social customs and restraints of the time period. Hannah and Sir John have some nice depth to their characterization and although not all the sub-plots were developed enough my taste, I highly enjoyed the primary story-line. This entry was posted in Individual Books and tagged Bath, Downtown Abbey, Jane Eyre, Julie Klassen, Lady Maybe, mistaken identity, mystery, Regency area, romance on February 15, 2016 by kvgaughan.